If you are a soccer player and you are looking to improve your athletic performance on the field then you first need to learn what your biggest weakness is. In this three part blog series, you will be introduced to speed, agility and power for soccer. By learning how to test each of these categories, you will begin to understand where you are lacking and you can focus on. The test for soccer speed is the 30 meter dash. The 30 meter dash is used is because the short sprint is similar to the distance you will typically be sprinting on the soccer field. The test involves running a single maximum sprint over 30 meters, with the time recorded. Set up two cones that are measured at 30 meters apart. A thorough warm up should be given, including some practice starts and accelerations. The player with start from a stationary position, with one foot in front of the other. The front foot must be on or behind the starting line. This starting position should be held for 2 seconds prior to starting, and no rocking movements are allowed. Signal the runner to begin the sprint and time the run with a handheld or automatic timer. The chart below shoes the speed of soccer players (taken from ESPN) stacked up against the fasted man in the world, Usian Bolt. 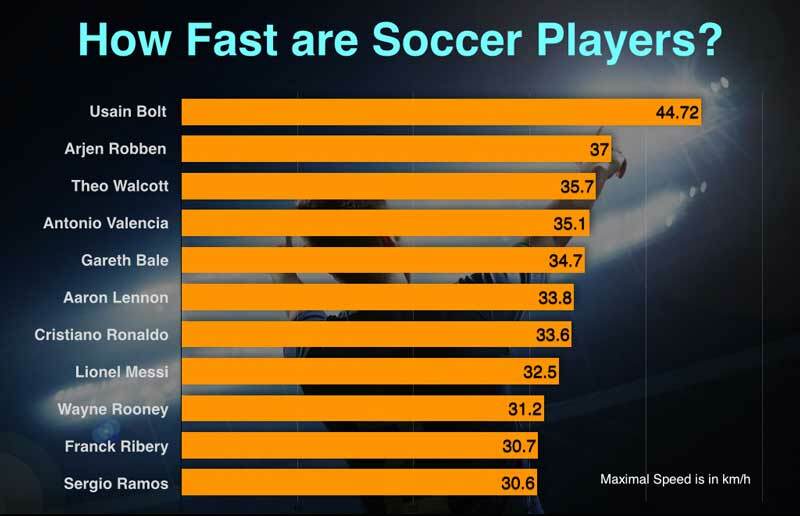 This goes to show that speed is an essential part of the game if you want to hang with the best. After you have tested your speed and have identified that it is a weakness of yours, you will need to improve it by performing specific drills. The below exercise is a speed drill that introduces your body to resistance while powering through a sprint. All you will need is a resistance band and a goal post to set up. Watch the video below to train soccer speed.